Elon Musk is dreaming big. 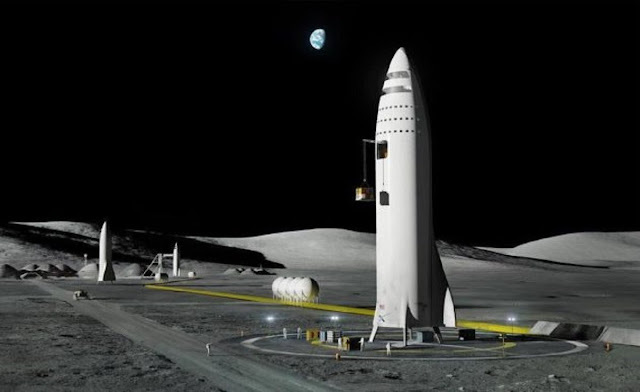 At the International Astronautical Congress in Adelaide today, Musk announced SpaceX’s plans for an enormous new rocket that he says will go to Mars in 2022 and maybe eventually provide speedy trips around Earth. The rocket, which Musk calls the BFR — the first and last letters stand for “big” and “rocket” – is smaller than the one he announced at the same event last year, carrying 150 tonnes compared to the previous design’s 300. It’s still more powerful than any of SpaceX’s or NASA’s other planned rockets. Musk said that he plans to replace all of SpaceX’s other space vehicles – the Falcon 9 and Falcon 9 Heavy rockets and the Dragon capsule – with this new system. “All of our resources will then turn to the BFR, and we believe that we can do this with the revenue we see from launching satellites and from servicing the space station,” he said. Once the BFR is up and running, he said, its first tasks will be satellite launches and bringing cargo and crew to the ISS. The top stage of the rocket will be big enough for 40 cabins, each of which could hold up to 5 or 6 people, along with a solar storm shelter and entertainment area. Musk said that after the initial 2022 mission to Mars, he plans to send 4 BFRs to Mars in 2024, two of which are set to be crewed. Musk’s plan is to have them mine water and extract carbon dioxide from the atmosphere to make fuel for return missions. As for landing on Mars, one of the trickiest problems in spaceflight, Musk says that the spacecraft will use a propulsive landing method similar to the one that Falcon 9 rockets use. But unlike the Falcon 9, it won’t have legs, instead landing back on its launch mounts. Finally, once SpaceX has sent a BFR to Mars, Musk said that the rockets might be used to travel between cities on Earth, shuttling passengers from New York City to Shanghai in 39 minutes. However, Musk has a reputation for setting deadlines that he cannot meet.